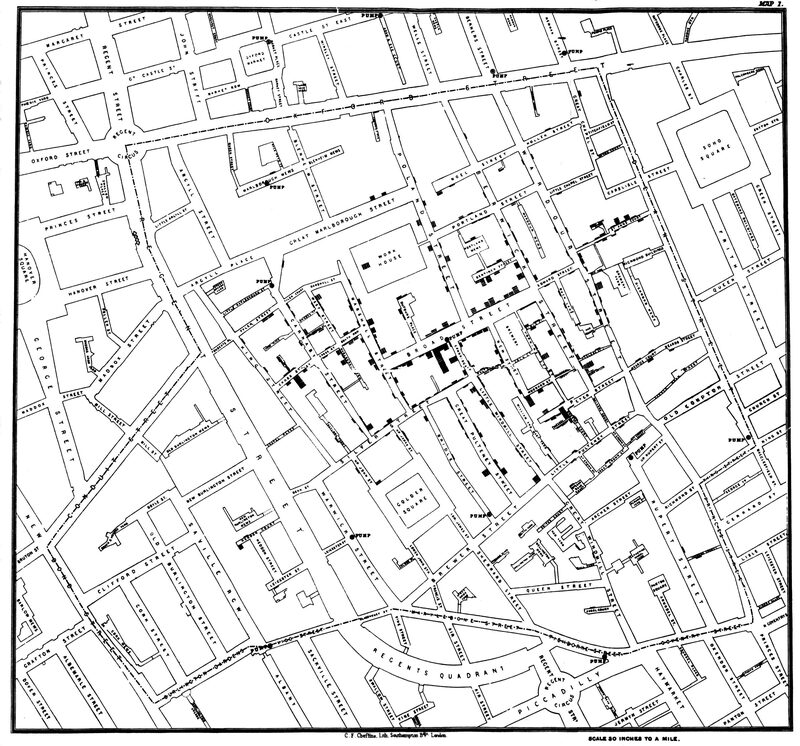 I’ve been reading Steven Johnson’s bookThe Ghost Map, about the 1854 cholera epidemic in Soho, London, that proved to be the breakthrough in linking cholera to infected drinking water, partly though John Snow‘s famous map. The book – which is wonderfully readable – is interesting for several reasons; as a social history of Victorian England; second, in tracing the battle between competing scientific and medical explanations of cholera; and third, for some reflections on the vulnerability of the modern city. Johnson describes 19th century London as ‘a Victorian city with an Elizabethan infrastructure’ – a boom town than had grown from a million people in 1800 to three million in 1850. One of the results was to overwhelm the complex ecology of specialist labourers – from nightsoilmen to pure-finders to bone collectors to toshers to mudlarks – which had managed the disposal of the city’s waste. Cellars and gardens became cesspits. The smell was notorious. Soho was a poor district in the heart of the city; families lived three to four to a room. Indeed, the present topography of Regent Street (big open streets running west to Mayfair, with limited access east to Soho) had been designed deliberately by Nash as a way to restrict the social exchange of rich and poor. John Snow, the scientific hero of the book, lived at the south edge of Soho. He had pioneered the effective application of chloroform so successfully that he had attended at the birth of one of the Royal children as anaesthetist. But – in his attempts to prove the link between cholera and infected water, which pre-dated the Broad Street [now Broadwick Street] outbreak – he would spend his evenings walking some of the roughest areas of south London collecting water samples from households for his research. Chadwick helped solidify, if not invent, an ensemble of categories that we now take for granted: that the state should directly engage in protecting the health and well-being of its citizens, particularly the poorest among them”. And that this required experts and institutions to address issues ignored or exacerbated bt the markets, and that doing all this can sometimes require huge investment. But when it came to cholera, the obsession with smell produced precisely the wrong solution: sewage was piped into the Thames (Bazalgette’s monumental sewer programme came later). The official Board of Health enquiry into the Broad Street tested the water-borne theory, but concluded “After careful enquiry we see no reason to adopt this belief”. (The terms of reference didn’t help). However, a second investigation, sponsored by the Parish, was more convinced, partly because Henry Whitehead, the curate at St Luke’s church, had been initially sceptical but was persuaded of Snow’s theory both by meeting him and reading his earlier work on the causes of cholera. More important, through, was Whitehead’s diligence as a social investigator, as he went round the parish knocking on doors and tracing the pumps which people took their water from. If this is a triumph for civil society, it is a triumph for something else as well: the invention of public health statistics, William Farr‘s “Weekly Returns of Births and Deaths”, which provided an evidence base for research. In some ways, Snow’s research method was the first time that an epidemiological approach had been applied to health research. But acceptance of Snow’s theory was not immediate; it took some years before it finally prevailed over miasma – helped by London’s Great Stink, which didn’t produce any surge in disease. Snow was dead before it was fully accepted. The map helped; the version that made the difference showed the distribution of deaths in the houses around the pump – and also the time taken to reach it, through the maze of Soho alleys and back streets, a map, as Johnson notes, of time as well as space. The Ghost Map quotes a line from Jane Jacobs, that “cities were the most helpless and devastated victims of disease. but they became great disease conquerors”. In the face of climate change, the density of cities becomes an asset. But they are also vulnerable to disruptive attack, especially assymetric attack. A nuclear bomb in a suitcase could kill millions, and a chemical or biological attack would be worse. But the microbes could have the last laugh. Although microbes have been managed through successive waves of public health reforms, “micobial life has an uncanny knack for mutation and invention”. Microbes modify and adapt rapidly. Unlike more complex forms, viruses can and do swap genes with other viruses, swiping lines of genetic code from one another, and creating the so-called ‘transgenic shift’. Public health professionals increasingly regard pandemics as inevitable, rather than being a risk or a ‘wild card’. In a world dominated by dense cities, many with poor public health systems, it’s probably only a matter of time before a microbe gets lucky – with effects which will be far devastating than the Broad Street cholera epidemic. The picture at the top of the post, of one of the several ‘ghost maps’ is from a review of the book at dylanstiles.com.